The Super Famicom Box was a special Super Famicom hardware system that utilized special cartridges and was used in hotels. Thanks to Kiryu1985, djense1, and d4s for the information and pictures. The Super Famicom Box was used in hotels as a pay-per-play system. It had a coin slot and a certain amount of money (possibly 100 yen) gave 5 minutes of playtime. The interesting part of this system is that it used special multicarts that contained two or three games. 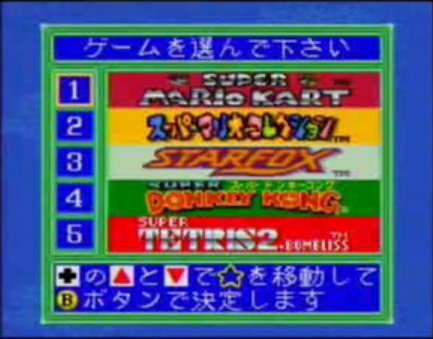 The Super Famicom Box has a special menu that allows you to select the game. It also gives introductory material for each game. The system uses a special hardware feature to add a graphics layer for in-game messages. It is notable for being the only Super Famicom system that fully uses S-CPU I/O-Port. d4s dumped several of the ROMs of the for the Super Famicom Box. The Waialae No Kiseki (Waialae Golf) and Super Mahjong 2 cart was also dumped and the ROM images provided, dumped by Paul Thacker and Guru. The game ROM images actually are different from the standard releases. I suspect the ROM image of Waialae No Kiseki is a bad dump, as it has huge areas of blank data that are not in the standard release (the first 0x10000 bytes are identical). Super Mahjong 2 is identical to the version 1.1 release. Presumably, the game ROM images would be identical to the standard releases. 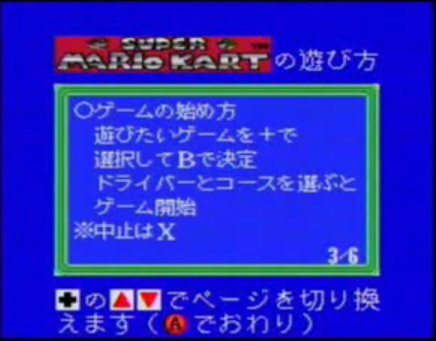 There is a SNES rom image in there (ATROM-4S-0), which called "4S ATTRACTION" in the internal header. Emulators don't seem to be able to load the image. It looks like it is mostly blank space. I included the Waialae No Kiseki ROM image, but I strong suspect that it is a bad dump. If emulator authors want to support the Super Famicom Box, it probably requires the standard release of the ROM image.